He was not only handsome and charismatic, but Corey Hart was prolific, producing an album a year through the middle of the 1980s, experiencing unprecedented popularity and success in Canada – and translating that to the elusive American market. 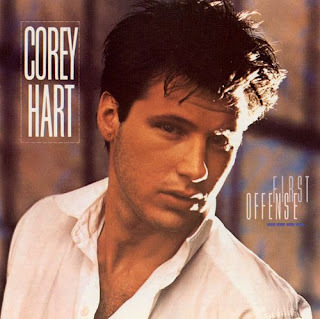 Corey Hart's debut album "First Offence"
Corey Hart kind of snuck up on me in high school. He released his debut album, “First Offence” in 1983, but it did not pick up steam in Canada until 1984. Oddly, it gained traction in the United States first, which led to a breakthrough in his native Canada. It began with “Sunglasses at Night”, showcasing that signature Cory Hart sound, going all the way to number seven on the Billboard Hot 100 in the States, and number 24 in Canada. It became a single synonymous with the decade. However it was obvious that, inexplicably, Hart had made a bigger impact Stateside then at home. His next single was “It Ain’t Enough”. By now Canada had taken notice, as the song went to number four in Canada and number 17 on Billboard. There would be two more singles, “She Got the Radio” and “Lamp at Midnite” that reached the top 40 in Canada, but were not hits. He would go on to be nominated for a Grammy for best new artist, losing out to Cyndi Lauper. Corey Hart had arrived and he was just getting started. and second effort, "Boy in the Box"
I really started getting into music in the fall of 1985. That Christmas, I got my first ever ghetto blaster, and began to listen to music regularly, even taping it off the radio. The main station I listened to was LA-107 FM, based in Lethbridge. It was an album-oriented station, where the announcers played more singles off an album then just the current release. By the time Corey Hart had released his follow-up album, “Boy in the Box”, I was listening to a lot of music on the radio. The first single was “Never Surrender”, and it was being played everywhere. “Boy in the Box” stayed on the charts for almost two years, churning out single after single. By the time it had run its course, the album earned Hart a number of Juno nominations including album of the year. “Never Surrender” went to number one in Canada and number three on the Billboard Hot 100 in the States. It would go on to win a Juno for best selling single in 1985, as well as nominations for composer of the year and best video. The title track, “Boy in the Box”, followed going to number four in Canada and number 26 on Billboard. It was a passable track, but did not have the impact or connection “Never Surrender” did. “Everything in my Heart” was next, returning Hart to the number one spot in Canada, but topping out at number 30 on Billboard. That was a surprise to me, because “Everything in My Heart” got the same air play as “Never Surrender” in Canada. It was a powerful ballad that showed Corey Hart could be a crooner. It would also earn Hart a Juno nomination for best selling single. “Eurasian Eyes” was a single I heard first on LA-107 when they were always playing additional tracks on their album countdown. I had also seen the video on “Good Rockin’ Tonite” which showed Hart bundled up for winter and walking with that patented pouty look, as steam came out of his mouth while he sang. The most notable part of “Eurasian Eyes” was that it also made an appearance in the sensual, much-talked-about movie, “9 ½ Weeks”. It would peak at number 29 in Canada and not even chart in the U.S.
“Komrade Kiev” and “Sunny Places – Shady People”, were two other songs I recall hearing on LA-107 that came from “Boy in the Box”, but they were never released or promoted as singles. “Boy in the Box” had run its course. The album featured one other thing that made it stand out. 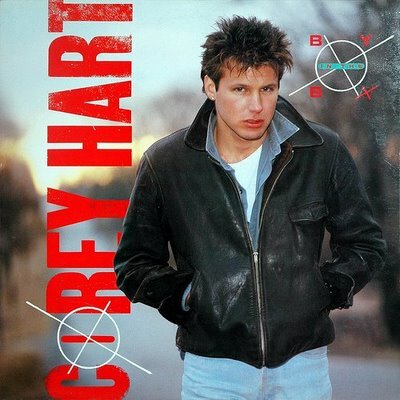 Included in each record was a poster of Corey Hart, a blown-up version of the album cover art. The last time I saw one of those posters was when I was working at Lakeland College in Vermilion in 1997. One of my co-workers was planning an '80s-themed activity and bought some used records on a trip to Value Village in Edmonton. Sure enough, she was stoked to see that poster still in the copy of “Boy in the Box” she bought used, and more than a decade old. Corey Hart's third album, "Fields of Fire"
It was like Corey Hart had not missed a beat. Once “Boy in the Box” had run its course, Hart fans did not have to wait long for another album. In the fall of 1986, Corey Hart was back on the airwaves with another crooning ballad, “I am by Your Side.” It went all the way to number six in Canada and to number 19 on the Billboard Hot 100. My best friend Chris Vining also told me the video was shot in and around Drumheller, where Vining had lived a few years earlier. That was pretty cool. For his next single, Hart reached into the past to cover another in what was becoming a growing list of ballads. “Can’t Help Falling in Love With You,” made popular by Elvis Presley, went to number one in Canada and number 24 in the U.S. It was a song, partly because of its rich history, that had staying power. There would be three more singles that kept Corey Hart top of mind through the rest of 1986 and into 1987 – “Angry Young Man” which peaked at 29 in Canada and did not chart in the U.S.; “Dancin’ with my Mirror,” which peaked at 16 in Canada and 88 in the U.S.; and “Take My Heart,” which peaked at 23 in Canada and again did not chart south of the border. The truth is Corey Hart was likely aided with these last three singles by Canadian content regulations which mandated radio stations play a lot of Canadian artists. None of these songs resonated with me, and seemingly few in the United States. It was the summer of 1988, and I was home after my first year of university when I heard my last Corey Hart single for a decade. “In Your Soul” was a catchy tune, unlike his other stuff, that went to number two in Canada and number 38 on Billboard. There were other singles, but my life got busy, and they did not seem to do well. The other four singles that were released did not crack the top 20 in Canada or chart at all in the U.S. It would be a decade before I heard from Corey Hart again. 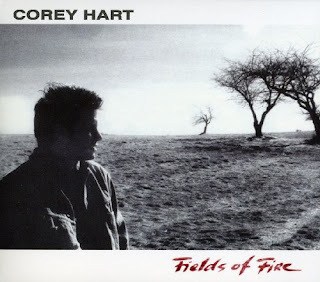 Corey Hart was also involved in some other projects in the decade. In 1985, he was part of "Northern Lights", a group of Canadian performers who banded together to record, "Tears Are Not Enough", to raise funds for famine relief in Ethiopia. It was classic Corey Hart again – brooding, pouty and powerful. Not a Christmas will pass without some radio station playing Corey Hart's rendition of "Rudolph the Red Nosed Reindeer". He would continue to write, record and release music all through the 1990s. “Black Cloud Rain” hit number two in Canada in 1996, followed by “Tell Me” at 14; and “Third of June” at 17. Perhaps my favourite of his later songs came out two years later. It was called, “So Visible (Easy to Miss)”, and it was the song playing on the radio when I was leaving Edmonton for the last time when I moved from there in November of 1998. Some of my reading revealed that in July of 1987, at the age of 25, Corey Hart collapsed backstage from exhaustion and had to take a break. That just illustrates how prolific Corey Hart was in the 1980s. He literally put out an album a year, and went on a major tour to promote each one for a good chunk of the entire decade. His music is part of the soundtrack of the 1980s for anyone who grew up in Canada in that period. It is interesting to see his music evolved over time as he matured as a singer and songwriter. The music also carried an uplifting message, with positive songs such as, “Never Surrender” and “I am by Your Side”. Corey Hart was on a talk show I saw right after I returned to Lethbridge in 1998, and one of the audience members pointed out that same thing – that his songs helped her out during low times in her life. He may have been a teen heartthrob, but some of his songs dug deeper than racing cars and being cool. That’s why, more than 30 years later, people are still listening to him, and why he has a place on the Canadian Walk of Fame. The Canadian Walk of Fame recently unveiled the stars of a number of outstanding individuals on June 7 and Robvogt80s will be honouring those people in a series starting now.